Not all indicators are negative, however. This analysis looks at the current information provided from the satellite-derived NDVI predictor. In key regions of the grain belt, NDVI shows positive indications of corn and soybean yields. CropProphet helps you quantify the impact of weather on U.S. crop yield and production. In this analysis we will review the current information provided by satellite-estimated NDVI for end-of-season crop yields. 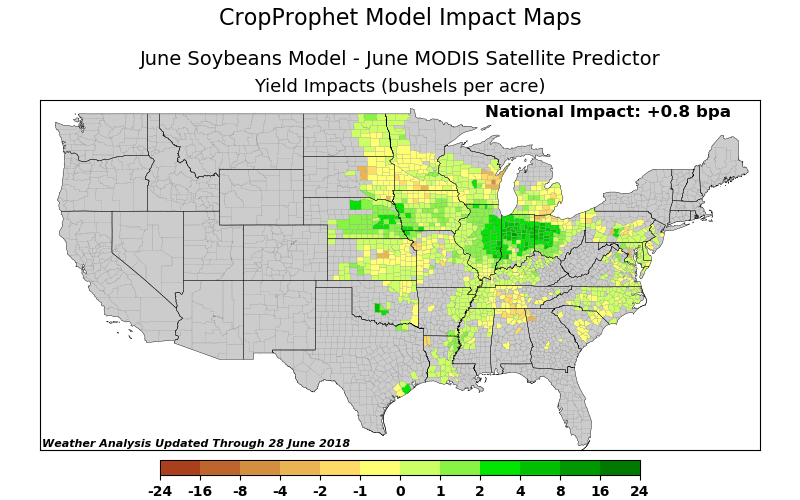 The CropProphet crop prediction system is a statistical model designed to provide maximum predictability for corn, soybean, and winter wheat yield and production as early in the season as possible while being very careful not to “overfit” the model. Overfitting is dangerous because a model can seem to be better than it actually is. CropProphet uses several inputs to predict crop yields and production. Consider that there are many possible factors such as temperatures, rainfall, soil conditions and others that contribute to beneficial or detrimental crop growing conditions. CropProphet models these factors to predict the end-of-season yield. At any given time, one input might be positively enabling yields to increase, such as when temperatures are perfect for growth, while at other times an input might be negatively contributing to growth, such as very low soil moisture. Last week we discussed the negative impacts of substantial precipitation in northwest Iowa and its likely impact on the U.S. national end-of-season corn yield outcome. We have noticed a trend in the “crop commentary” space that there are many commentaries but virtually none of them actually quantify the impact of some event on national grain yields. CropProphet does that for you, so you don’t have to guess at the impact. We don’t want to focus on negative weather factors all the time; if we did, CropProphet might be accused of trying to generate market “hype” rather than providing an objective crop yield forecast year in and year out. Below is our current estimate of the overall contribution of satellite-derived NDVI information to the U.S. national end-of-season corn yield forecast. As of the end of June, the NDVI contribution is +1.8 bushels/acre to the U.S. national corn yield number. While most of the country is generally varying around zero bu/a impact, we can see very positive values of yield contribution in key parts of the Illinois, Indiana, and Ohio corn growing regions. In other words, satellite information suggests that the crop in those regions is doing quite well so far. NDVI stands for “Normalized Difference Vegetation Index” and is information created from satellite sensors. The satellites are basically measuring how green a specific area is, and this indicates the health and growth of plants in that area. Comparing NDVI data to crop yields for a specific county over many years means that the relationship between NDVI and yields can be found. It is important to note that NDVI does not directly measure the factors that enable corn to grow, such as sunlight, rainfall and mild temperatures. The NDVI information is a result of corn growth and responds to corn development, and therefore NDVI is a lagging indicator of crop health. Despite this, the NDVI at this time of year can help to predict end-of-season corn yields. NDVI is also helpful for predicting soybean yields. The map below shows the contribution to yield as estimated by NDVI for soybeans. The same important regions in Illinois, Indiana, and Ohio show very positive contributions. The estimate of the impact on overall U.S. soybean yield is +0.8 bushels/acre. The analysis shown here illustrates how CropProphet quantifies the impact that weather has on crops. By combining a wide variety of predictors, we provide an objective quantification of the impact of weather on crop yields and production. Subjective market commentary can help provide context, but too often it leaves the reader to estimate the true impact of the weather on crops. CropProphet ensures you no longer have to guess. Avoid the Hype. Get the facts. Use CropProphet for your grains markets intelligence.